Which of the yacht charter vacations fits your time of relaxation or venue? Crewed vacations or bareboat vacations, a group charter for 3 couples or just for the two of you. No matter where you want to be: The Caribbean, Bahamas Islands, Meditterraenean, or other worldwide coasts, tropical islands. We plan all aspects of your luxury yacht vacation based on your unique preferences. Our goal is to make planning your yacht charter vacation completely custom, detailed and easy. Whether you want a fully crewed yacht for your group or want to be the captain on a bareboat charter in any area of the world, we offer just the perfect boating options that match your unique needs. Step aboard the ultimate fulfillment of your dream vacation, a private luxury yacht charter where every aspect of your vacation is tailored to your unique preferences, interests and tastes. Video: Experience the luxury of a yacht charter. A wealth of refreshing new experiences beckon you on the crystal clear waters of your choosing. From the Caribbean to the Bahamas, the Mediterranean and the Seychelles, from South Pacific to Mexico and Panama, and of course Miami and Fort Lauderdale and all throughout New England. Your journey of a lifetime starts here, and is just a phone call or email away. We share your passion for yachting. With crewed yacht charters experience ultimate pampering. We arrange large mega yacht charters, or medium size luxury yacht charters complete with a captain, crew and executive chef. This professional crew handles all of the navigating and logistics, so you have relaxing vacation while enjoying impeccable personal service. Whether you prefer silver service or a more casual fun-loving service style, we will match you with not just the right yacht, but also the right crew to provide you with the type of experience you are dreaming of. Available crewed vacations include, family yacht charters, romantic charters, charters for a group of couples, a group of friends or relatives or business associates aboard private luxury crewed yachts of all types, styes and sizes in worldwide destinations. More Information on crewed yacht charters vacation option. Served a cocktail while sunbathing on crewed yacht charter. What Better Way To Spend Quality Time with Those Special Friends? Avoid the hotels in tourist trap destinations and overcrowded beaches for your next vacation. You've been there, done that and it's time to think outside of the box. What about a group yacht vacation with those special friends in your life. We get many enquiries for Group vacation with groups of couples or multiple families, and are happy to arrange for it in spectacular destinations with better views, beautiful explorations and exciting island discoveries each day. We have just the right ships to host larger group events from family reunions to corporate strategy and motivational sessions. Whether your group ranges in size from 10 to over 150, with these charter options, we can arrange a breathtaking Caribbean or Mediterranean yacht vacation that will amaze all of your guests. Couples ready for lunch on private yacht charter. Exceptional Cuisine, a Memorable Event, Wonderful People: a Great Celebration. Ideal for corporate and VIP private parties, weddings, birthdays, anniversaries, bar/bat mitzvahs, product launches, awards ceremonies or any celebration that you would like to leave lasting memories. No matter how large your party from 15 to 400 we can arrange the private yacht for you. Complete with custom catering and onboard live entertainment. For a one-of-a-kind conference promotion we will create the unforgettable event you are looking for. 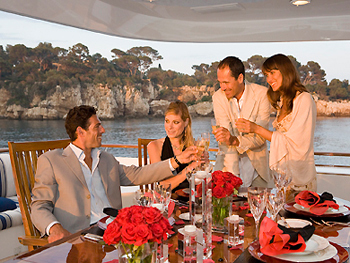 More information on Corporate Events Yachts and Party Yacht Charters. 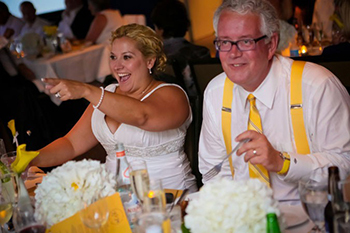 Wedding and reception on a party yacht charter.